Business owners and key employees are finding it more difficult to adequately save for retirement. Why? Qualified retirement plans and group insurance plans, even Social Security, place limits on contributions, layouts and tax advantages of benefits for highly-paid individuals. Industry retirement experts suggest we need at least 80% of pre-retirement income to maintain our current standard of living in retirement. With qualified plans and Social Security alone, you and your key employees could receive as little as 30% of your current income at retirement – creating a retirement income gap. Cash values from life insurance can help fill the income gap. This information is from the Principal Financial Group Replacement Ratio Calculator with source information from the Annual Statistical Supplements to the Social Security Bulletin. 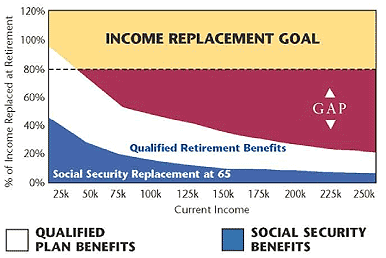 It is intended to demonstrate the potential impact of Social Security and 401(k) plan benefits at various income levels. For more information on your individual circumstances, please speak with your financial professional. Securities and Investment Advisory Services Offered Through M Holdings Securities, Inc. A Registered Broker/Dealer and Investment Adviser, Member FINRA / SIPC. Heritage Capital Strategies, Inc. is independently owned and operated. The Heritage Capital Strategies is a member of M Financial Group. Please go to www.mfin.com/DisclosureStatement for further details regarding this relationship.